Line-Ward’s L2 Line Layer is the most compact, most maneuverable, most powerful walk behind lawn plow on the market. The L2’s cutting blade is positioned in the exact center of the machine. This maintains all of the L2’s weight directly over the blade rather than a small percentage of total weight as with the rear mounted blades on Ditch Witch and Vermeer walk behind plows. This also allows the L2 to easily make tighter turns than the competition as the entire unit pivots on the blade when turning. Having the blade in the center of the Line Layer also maintains a more consistent burial depth when going through dips and rises in the work area. 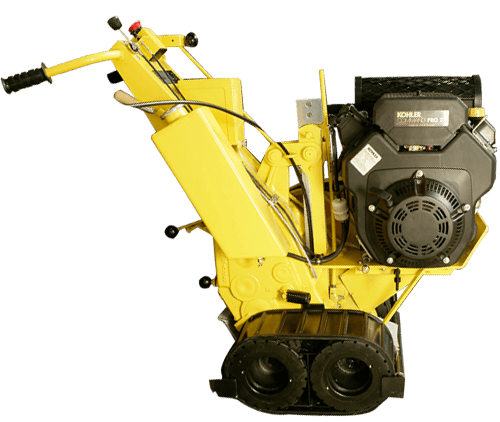 The L2’s maneuverability along with its 26″ width allows it to easily work around retaining walls, fence gates and the other landscaping features encountered on a typical underground line installation. Another advantage the L2 has over its competition is that it drives on rubber tracks, not tires as the Ditch Witch 100SX, Vermeer SP15 and larger vibratory lawn plows do. Tracks provide more traction and less lawn disturbance while the additional flotation of tracks allows the L2 to work in the wet lawns of spring and fall in seasonal regions. All cutting blades for the L2 Line Layer are easily adjusted from 4″-13″ by 1″ increments allowing more control over depth. Where conditions allow, 16″ depth blades are available for more ground cover. When you add it all up, the Line-Ward L2 Line Layer comes out ahead of the competition. Since 1972, Line-Ward has hand-crafted the highest quality Line Layers and boring equipment specifically designed for seamless underground cable and pipe line installations. All Line-Ward line laying equipment is based on the original design patents held by its founders. Copyright © 2019 Lineward | All Rights Reserved.